The Shop With a Cop program embodies the meaning of Christmas in the best possible way. They are giving so others can give. 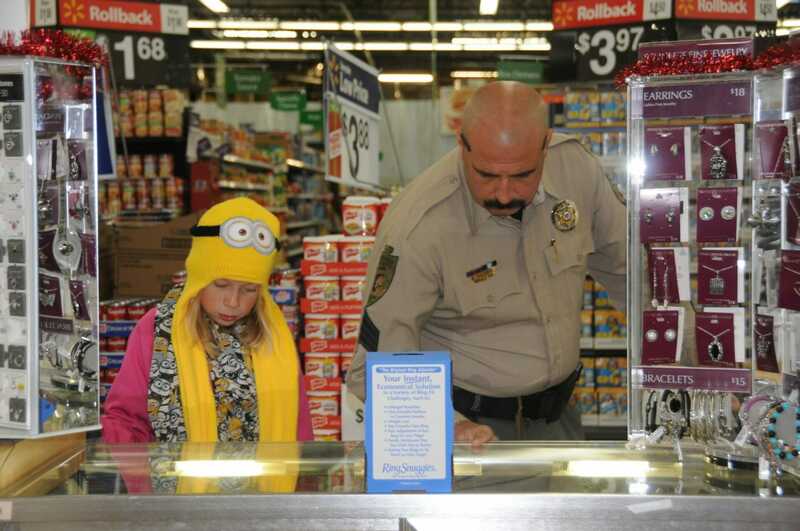 At least, that’s what Denise Celentano, coordinator of the Benson, Arizona Shop With A Cop program found. Have you heard of this beautiful program? Its purpose is to provide a fun day for children in need, give them an avenue to purchase Christmas presents on their own, and establish positive relationships with law enforcement. After six years, Denise has discovered it has done so much more. The day starts at five o’clock in the morning when about forty local police, county sheriff’s deputies, Representatives for the Department of Public Safety and ATF, and border patrol arrive at the largest hall in town. Half an hour later, parents bring in sleepy eyed children who receive a name wristband with their guardian’s name, phone number and the officer who will be paired with that child for the morning. “You’d be surprised at the number of grandparents who have custody of these kids,” Denise told me. 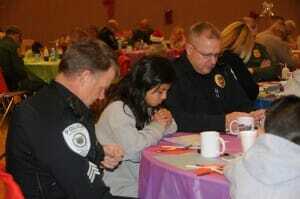 In Denise’s program, the parents go home so this will be a special day just with the child and the cop. The pair get acquainted over some form of activity page, eat breakfast, and then get their picture taken together. Then it’s time for the big Roll-out. Each child gets in a police car with their officer. They quietly pull out of the parking lot. When they reach Main Street Benson, bedlam breaks! The police turn on the lights and sirens full throttle. The kids love it! They parade down Main Street to the local Walmart where employees are waiting outside for them. Six names are drawn to receive free bikes. “They get to choose any bike they want in the store,” Denise said. Every pair receives $130. In Denise’s program, the child can spend that money on anyone they want: themselves, family or friends. Other SWAC programs dictate the child will spend the money on their family, then one child in need. 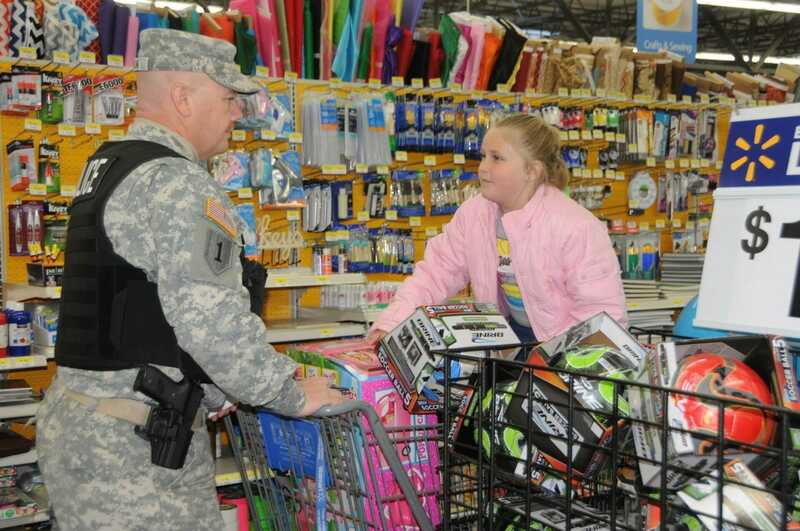 Shop With a Cop is run like a franchise so how the program is run depends on the local coordinator. For Benson, giving the child free reign works in ways they didn’t predict. To their surprise, children often bought for others or chose to buy clothing for themselves rather than toys. The kids aren’t allowed to get inappropriate items like mature movies and the cashiers are trained to spot and refuse those items. The children bring their gifts back to the hall and a teen group—either the National Honor Society, a church youth group, or some other teen organization—help the children gift wrap their purchases. Who gets the biggest blessing out of this program? I laugh as I write that. Is it the child who gets a thrill out of hearing those lights and sirens? The child who grows up to become a cop because of the positive experience? The child who learns to trust a cop, not as the bad guy who locked up a parent but as a good guy the child can call in time of need? 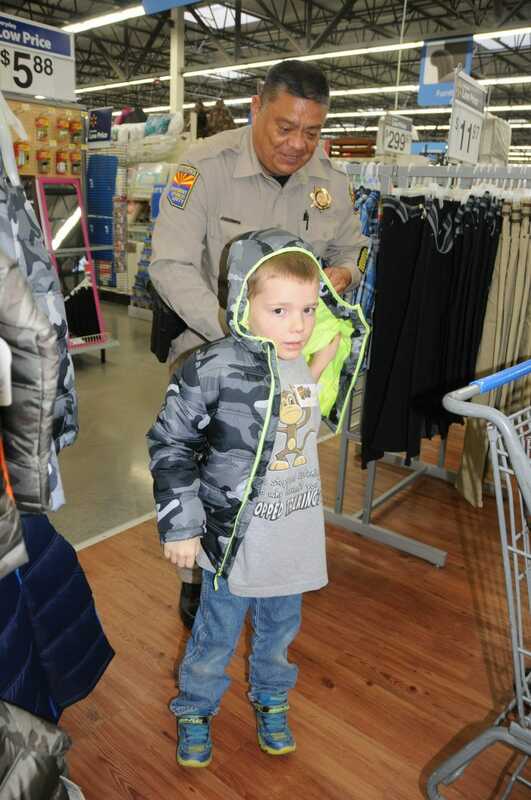 The kid who is given the chance to give, who because of Shop With a Cop, learns how to give? Or is it the law enforcement officer? The guy who for one day gets the image of a good guy? “We help the children, but it helps the cops,” Denise said. “The cops can’t wait to do it next year.” One deputy came in one year, nursing a grudge. He was there because he was told to be there. But by 10:30 when he had delivered his charge back to the hall, he met Denise in the parking lot, choking back tears because his charge brought presents for his family instead of himself. The following year, that same cop recruited rookie officers to join him. Next year, since Denise and her husband are retiring, the Cochise County Sheriff’s Association will oversee the program. Already, funding has been raised to involved around 75 children. Before the Big Day, each volunteer gets a bio about the child with whom they will spend the morning. 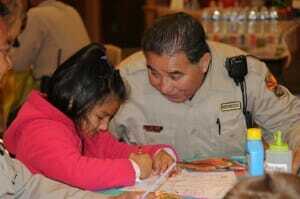 This helps the officer get insight into the child’s life. Bridges are built both ways. “Children who have a family member in jail are first picks for the program,” Denise said. Maybe it’s the teens who get the biggest blessing. While they gift wrap and help in other small ways, they are watching and learning from those who choose to look beyond themselves to bless others. Denise, who has a gift for coordinating community events, has involved her own daughter all along. Throughout high school and college, her daughter followed in Denise’s footsteps and has worked with an AIDS organization and March of Dimes. She continues to work with the Shop With A Cop program even after her mom chose to step down as coordinator. For years, Denise helped raise funds for a foster children’s home in Benson. She found great joy in finding ways to make hurting children happy again and to see that they were taken care of. When she first started as coordinator for the Benson Shop With a Cop, she mainly did it for the children at the children’s ranch. The program grew to include many other children. 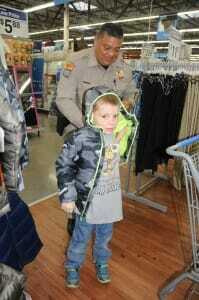 Shop With A Cop gives so others can give.